Future National Parks: Where to next? Lauren Pease on Future National Parks: Where to next? 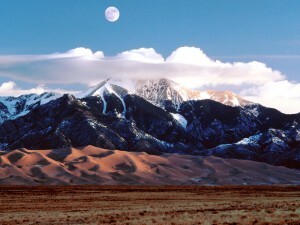 I can honestly say the Great Sand Dunes is one of the most breathtaking places I’ve seen in my lifetime. Unlike all of the other National Parks I’ve written about this semester, this one is special to me because I did not visit it with my family. 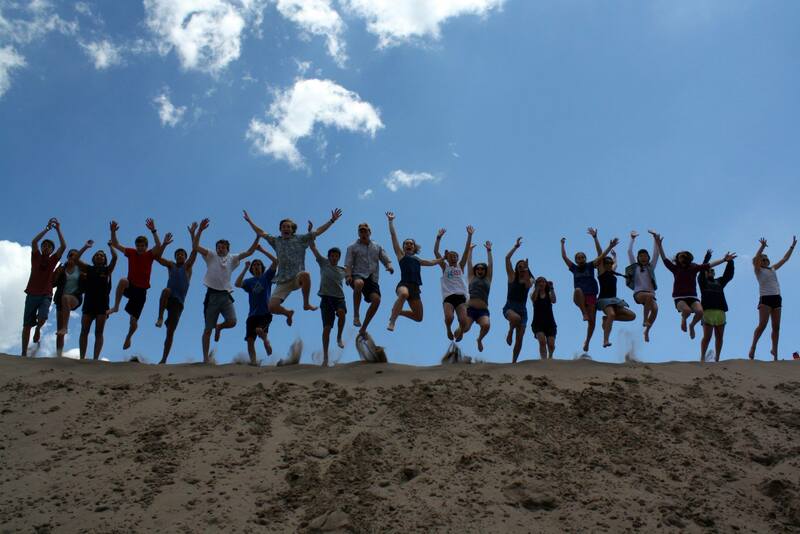 During the semester I spent in Colorado my junior year of high school, my forty-one classmates and I took a road trip to visit the dunes on weekend. 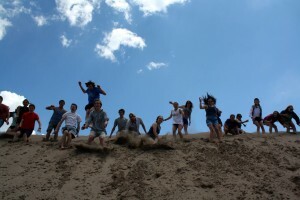 Needless to say, we had an absolute blast. We hiked for what felt like hours to reach the highest point we could see. It was an incredible calf workout, so we took lots of breaks just to take in the view. We had hours to explore on our own and nowhere to really go: just the endless vast of rolling mountains of sand ahead, juxtaposed so beautifully against the San Juan Mountains on the west and Sangre de Cristos on the east. 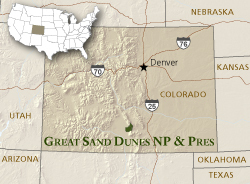 The dunes sprawl for almost thirty miles through Southern Colorado’s San Luis Valley, a broad, arid plain between the two mountain ranges. Geography never ceases to amaze me.
. 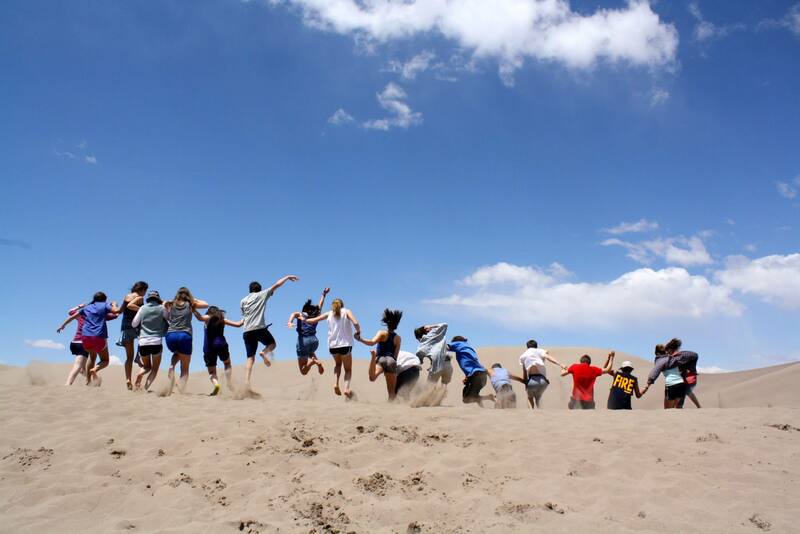 If you ever get the chance to visit, there’s really only one thing for you to do: explore the dunes! Climb until you can’t take another step, and then just sit, reflect, and take in the view. 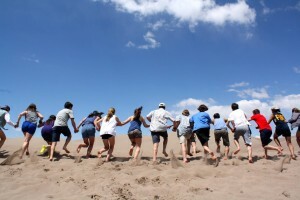 Release you’re inner child by sledding and sliding back to the bottom. To cool off, wade in one of the many streams that run along the perimeter of the dunes. Hop back in your car having experienced something incredibly unique to the United States, and thank your country for designating it as a protected area for future generations to enjoy as well. This entry was posted in Colorado, March and tagged adventure, colorado, exploration, friends, miles21, National Parks, nature, rcl1415. Bookmark the permalink. Wow, you took some amazing pictures. It looks reasonably empty, which would make a visit even cooler. 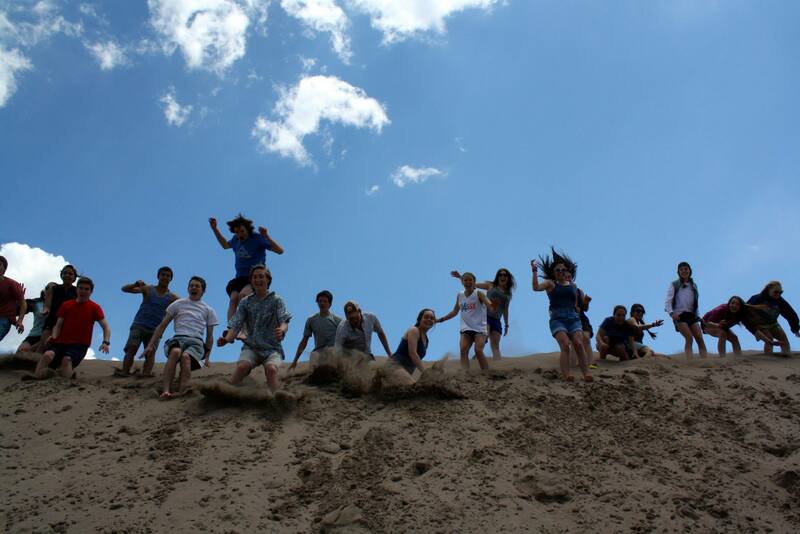 I have been in sand dunes in Michigan once. I tried sledding down them, but that didn’t work. We had a friend who owned a sand rail (basically a super fast go cart meant for sand). Riding around in it was awesome. It felt like I was on a roller coaster except less safe. Strangely I am afraid of roller coasters but not of sand rails. This looks absolutely breath taking and beautiful. Your posts always make me want to go book a nice summer trek to all the national parks. I look forward to your posts every week–they give me a good taste of summer because I love to spend as much of it as I can outside. As always, thanks for sharing! Ugh, I’ve always wanted to go to Colorado! It seems so beautiful. I’m usually not a hiker, but I think that’s just because I don’t get the opportunity to do it often. This place seems awesome though I’ll be sure to check it out if I ever make it Colorado! Really good post! I have never heard of this park before, but it sounds awesome! 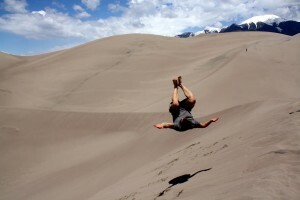 When I think of sand dunes I certainly do not think of anywhere in the United States. Its easy to forget how huge and geographically diverse the country really is. I think it would be strange to see sand dunes and no ocean near by, but 40 foot dunes are really impressive. The geology side of this is also really cool, the sediments would provide a lot of information about the past environment. I definitely want to go there someday! This sounds awesome! Your pictures you used are great and you provided a lot of information on such a cool place. I’ll definitely have to go there because it just looks so beautiful! 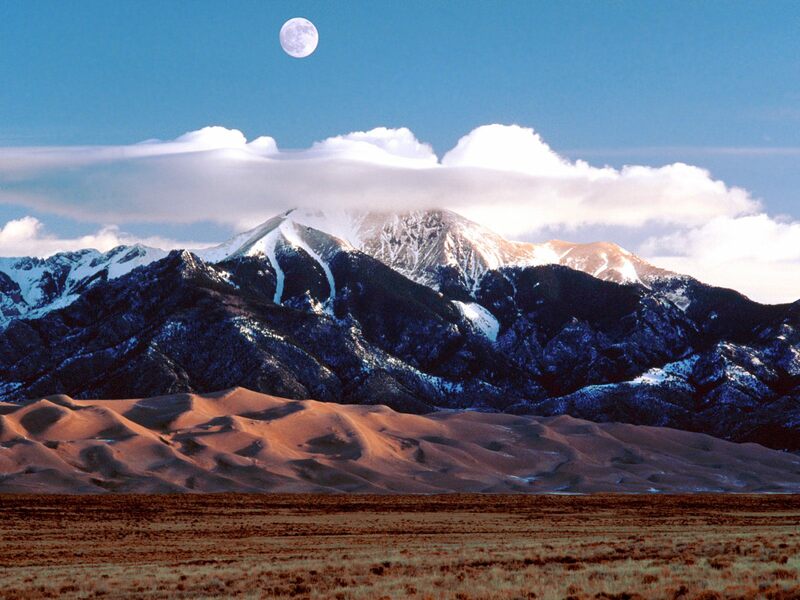 Great Sand Dunes seems like an other-worldly landscape. I was surprised to here that streams run between the dunes, but I’m sure that makes it more enjoyable to hike. 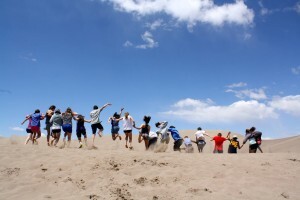 When going to the beach it has always bothered me that you’re not allowed to play on the dunes, so I’m sure I would have a blast at this park. The picture you included in the top, with the mountains in the background with the moon, is one of the most beautiful landscapes I’ve ever seen. 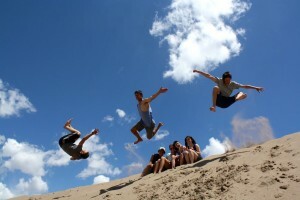 From what I could see in the pictures, the contrast of the bright blue sky against the sand is what really makes the scenery. The pictures just seem awesome; I’d love to see this some day. I was not aware of this park actually before this post, and I was even more surprised to hear it was in Colorado. Cool post!